The definition of saddle fitting varies from country to country and from professional to professional. Traditionally, in the United Kingdom, a rider hires a saddle fitter when first purchasing a saddle. The saddle fitter arrives at the client’s stable with an array of saddles for his or her discipline, and helps the rider to choose the best fit for both horse and rider. In the United States, however, the services saddle fitters provide can be more varied. While some U.S. saddle fitters do follow the UK model and help a client choose the best new saddle, others go further and provide services that can assist horse and rider throughout the life of their saddle. The saddle fitter can help the rider and trainer best determine how the saddle fits the rider—you’ll know from the comfort level if your saddle is right for you. But because your horse can’t talk, it’s harder to determine if the saddle fits him, and that’s where a fitter can help. Some professionals such as Chiropractic vets and massage therapists will also offer saddle fitting as one of their services. Does this mean they will reflock your saddle? Not necessarily, but they can evaluate the fit and further recommend a competent fitter who can reflock your saddle to better fit your horse. With different approaches and methods of saddle fitting, take your time and choose the right fitter you’re most comfortable with. Why Hire a Professional Saddle Fitter? A poor saddle fit can do more than just cause pain and discomfort to your horse—it can also result in poor performance, bad behavior, and training problems. You and your horse will always work better as a team when the saddle fits correctly. When evaluating the fit of a saddle to a horse many aspects need to be taking into consideration. 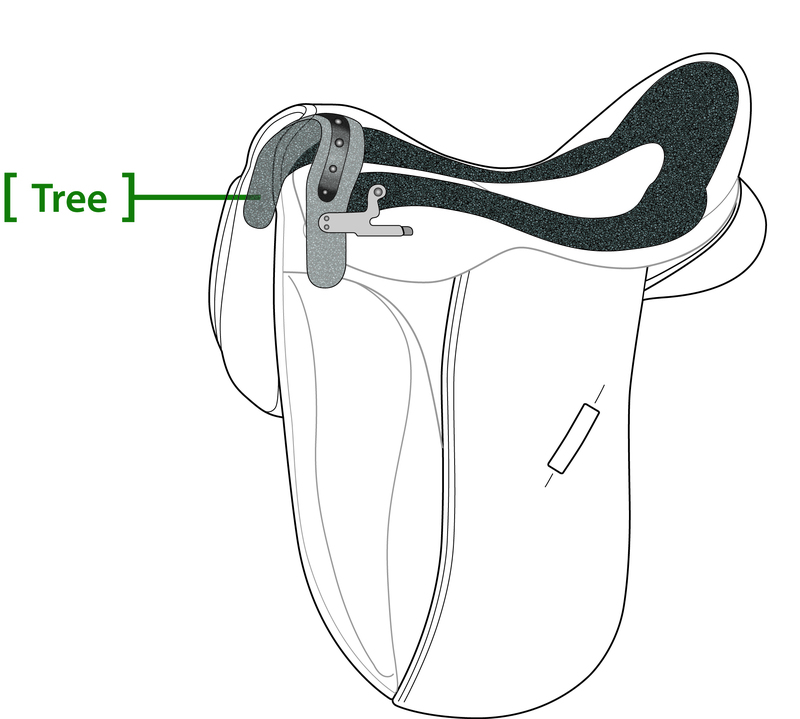 The tree of the saddle should match the shape of the horse’s topline. In other words, the anatomy of the saddle should match the anatomy of the horse. The shape of the tree should match in both the width at the head and also the curve from the withers back towards the croupe. 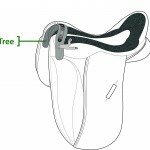 The panels are the interface between the tree and your horse’s strong, sensitive muscles. The shape and style of panel is important in how they relate to different sizes and shapes of topline confirmation. The panels should be firm but also yield easily to excessive pressure. Supportive but also shock absorbing. They need to evenly distribute the rider’s weight and all pressure uniformly. 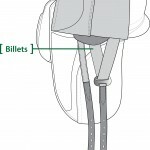 Billet configuration is an often forgotten about element of saddle fit. 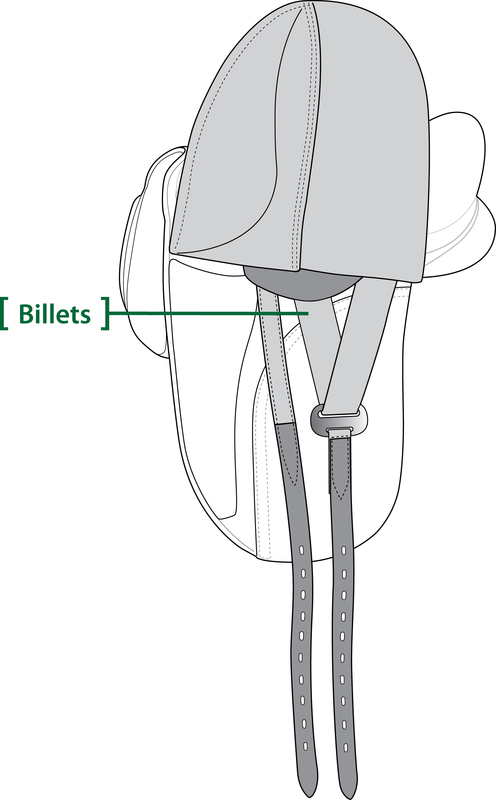 Different billet configurations and positioning also determine how a saddle can be flocked for optimal fit. This is mostly relevant with dressage saddles and point billets. Lets take a closer look at how saddle fit affects your horse. Consider the placement of the stirrup bar on your saddle. This is a very common site of a corresponding pressure point in the panel underneath. This pressure point sits directly on top of the latissimus dorsi & longissimus dorsi muscles, and to a degree the Thoracic trapezius. With a pressure point present, it puts these muscles into a state of contraction. 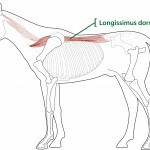 The job of the longissimus dorsi muscle is to extend the spine & neck (hollows the back & pulls the head up) A horse’s longissimus muscle is an extremely long muscle that runs from his poll to his pelvic girdle along his spine. The saddle rests on this muscle. Today, dressage riders (and others) seek to get the horse to round his topline into a bascule such that his hind end engages underneath him. 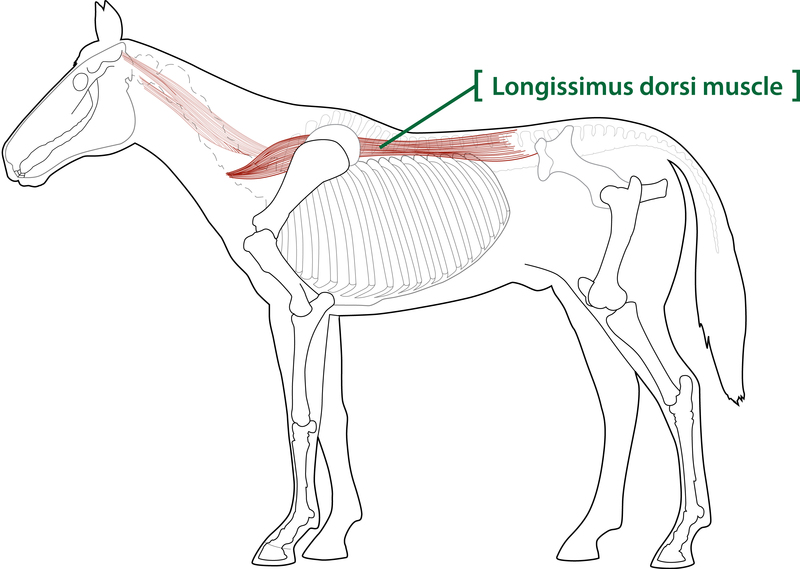 However, pressure from an ill-fitting saddle upon the longissimus muscle can cause soft tissue damage and pain, resulting in a top line that is actually inverted from the optimum position—the horse puts his head up in the air and rotates his hind end outward. The longer this condition is allowed to persist, the more the muscles build into this configuration, making it harder and hard to achieve the correct line. In addition, the positions the horse uses to compensate may put undue pressure on his joints, especially his hocks, and result in lameness and behavior issues caused by the discomfort. The job of the latissimus dorsi muscle is the flex the shoulder and assist in pulling the forelimb back. The Thoracic Trapezius’s job is to elevate the shoulder & draw it backward. An ill fitting saddle can also put pressure on the horse’s trapezius muscle, impairing the proper operation of his font legs. Thus, the horse will be unable to achieve his optimum stride, and may instead be forced to compensate for the pain with a contracted stride that does not best utilize his musculature. Saddle pressure points that force either the trapezius or the longissimus to contract affect the horse’s entire performance and keep his (and you!) from reaching your potential. For this reason it is a good idea to ensure that the saddle fits properly. The origin or insertion points of these muscles are all directly attached to the scapula or the spine and its ligaments. When these muscles are compromised they’ll affect the action (job) they’re supposed to perform. 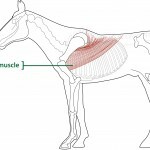 When these muscles are contracted, the horses back is now inverted (hollowed with the belly pushing towards the ground) and the front limb is stuck, causing a short choppy stride. These muscles also work in conjunction with other sets of muscles, so if one muscle is affected it’s going to affect its partner and the bones they are attached to. 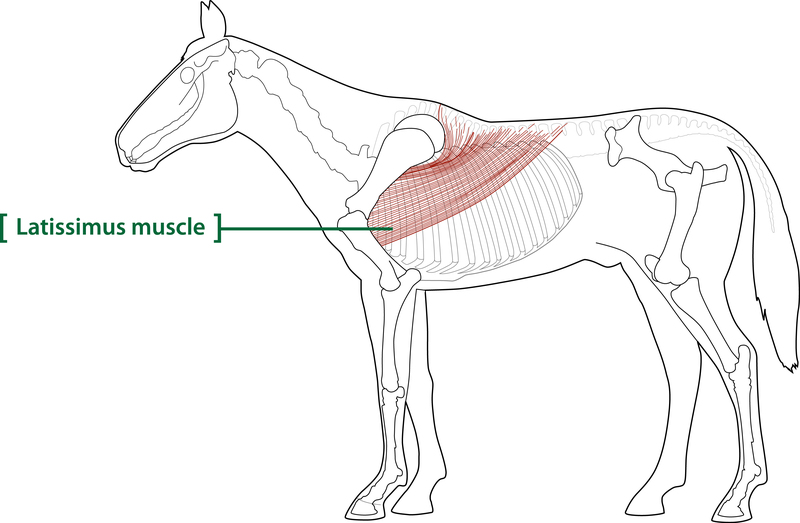 Reasoning that muscles play as part of a team, if any of these muscles are affected by an ill fitting saddle they’ll affect the bone they are attached to and it’s corresponding muscles, and so on down the line. To a further degree, an ill fitting saddle with other pressure points and problems also directly affects the thoracic trapezius, rhomboid & serratus muscles. Saddle fitting is best performed on a regular schedule, as a maintenance activity that helps to avoid problems, much like having your horse’s teeth floated every year or having his feet trimmed and/ or re-shod every six weeks. With regular attention of a saddle fitter, you can keep problems from developing to the point where a vet, chiropractor, acupuncturist, or message therapist are also needed, and can avoid pain that interrupts your horse’s routine.